After more than a decade of visits to wineries around the world, husband and wife team and owners Christine Sabo and Ed Sunkin created at Silver Run a culmination of their favorite experiences. - Taste a product from the local soil. - Experience the culture from a local family rooted in the area. - Learn about the local history. The first commercial harvest in the fall of 2010 featured the crushing of grapes grown on the local soil. A proud graduate of the hometown Chippewa High School, Ed has many Rogues Hollow stories to tell. Christine hails from the neighboring community of "Norton Pride" land and is a Norton High School alumna with a lot of experiences in the area to share. Both Ed and Christine earned degrees from the nearby University of Akron and continue to cheer on their local Zips! The tasting room at Silver Run features some of Doylestown's historic landmarks in photos Ed captured and Christine created into artwork to help tell the story of Doylestown on the winery walls and wine bottle labels. Relax by the fireplace in the tasting room or drink in the breathtaking sunsets while sipping wine on the covered back porch. Bring your favorite picnic food or order in from nearby restaurants that deliver to the winery. Hours of operation are Thursday and Friday, 5-10 p.m. and Saturday, 1-10 p.m. Reservations for private events such as garden club meetings, bridal showers, birthday and retirement parties and special celebrations are available during our non-public hours.. Indoor seating is available for 100 guests. To make a reservation for your event, please call 330 671-1115. 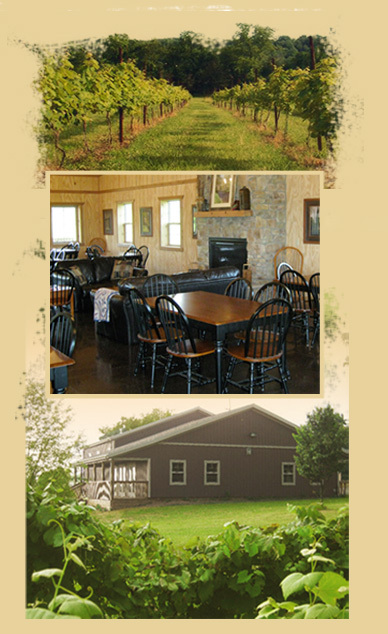 Visit soon and enjoy the experience, adventure and tastes offered at Silver Run Vineyard & Winery.